Here's the Heroquest Gargoyle in all his demonic glory and what is surely a mock crucifixion pose. I know a lot of people regard this miniature as an absolute turd but I've always had a soft spot for him, because at the time it was the most bad assed mini I'd ever seen. Those familiar with the model may notice that is not the whip that Bloodthirster Jr is traditionally armed with- it's actually made from a twisted up cigarette rolling paper (actually, it was the bit that that tells you "10 to go") with superglue poured over it. Imagine how bad assed he would have been if I'd left him holding that Ork chainsword. All praise be to Khorne the Blood God! Actually, most if not all praise to Dettol, god of strippers! Fell Chaos Warriors, deadly are their axes, static are their poses. The plastics are stand ins/extras until I get around to painting the proper Heroquest minis. The metal with shield will represent a Chaos Warrior Champion when the quest calls for it. My freehand shield design skills need some serious work, but I am still happy enough with this crude and primitive design, which after painting it reminds me of the art seen on Mambo surfwear. I never really knew of Citadel's Snakemen range until about a year ago, and I knew I had to get at least one when I saw them. Talisman Necromancer, paying homage to Shakespeare or summoning forth terrifying Mummies? Nice to see the bad guys ! Looking at those last recaps of yours I realise how busy you've been and you have a very nice collection of models for RPG and HQ now ! Its definitely not a turd of a sculpt IMO. Its maybe not terribly gritty, but the Gargoyle has a cheesy, Saturday morning villain sort of appeal. I have one lined up for clobbering a few Ordo Malleus at some point. That paint job is cool too, straight out of the Heroquest ads. Assless I've painted more in the past two years than ever before. 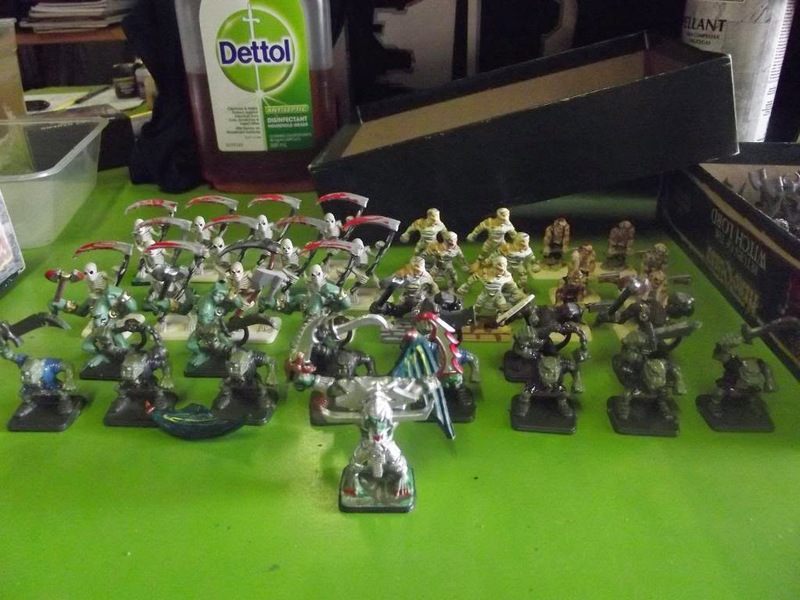 Never so many painted minis, never so few games played! cheetor as it happens I have a spare that I have plans to use as a Daemon Prince for 40k at some point. The paint job is indeed as close to the McVey painted version depicted on the ads and booklets as my mortal painting skills could get. After posting this I noticed I'd managed to chip some paint off the end of his nose.